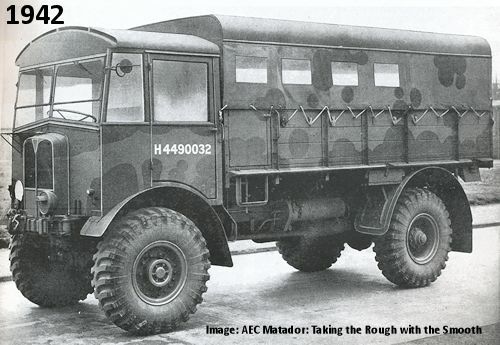 This is the third kit from AFV Club in their AEC series following the previous kit of the AEC Dorchester (kit 35227) and AEC Matador Truck Early Type (kit 35236) and basically represents a 1942 production Matador with revised double metal cab roof for the “classic” Matador appearance along with revised small front lights, the remainder of the kit is basically the same as the previous kit. 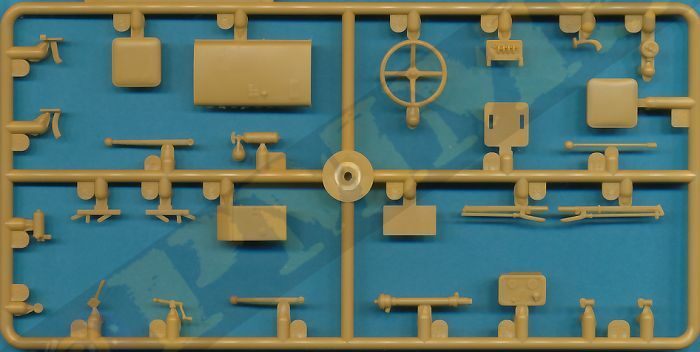 Also included with this kit is a bonus resin driver figure and the two rack mounted jerry cans are now provided in resin and not the plastic ones from the previous kits. 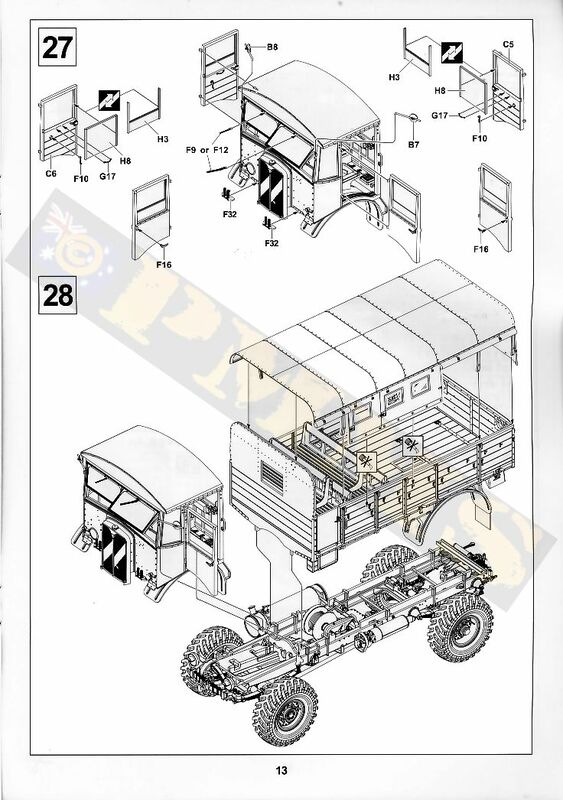 The kit again uses the basic chassis and suspension for the Dorchester/early Matador kits so you need to take care when selecting the parts as the original parts are still included. 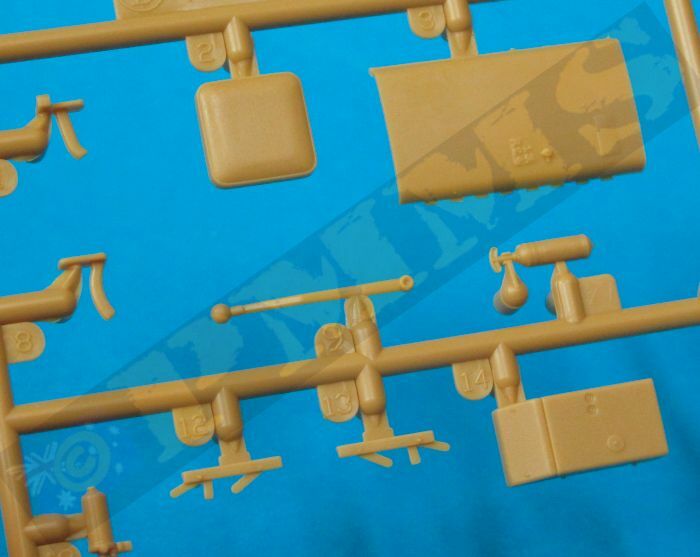 The other thing to watch is due to some sprues being from the Dorchester kit and others new for the Matador kits there are duplicate sprue numbers. i.e. 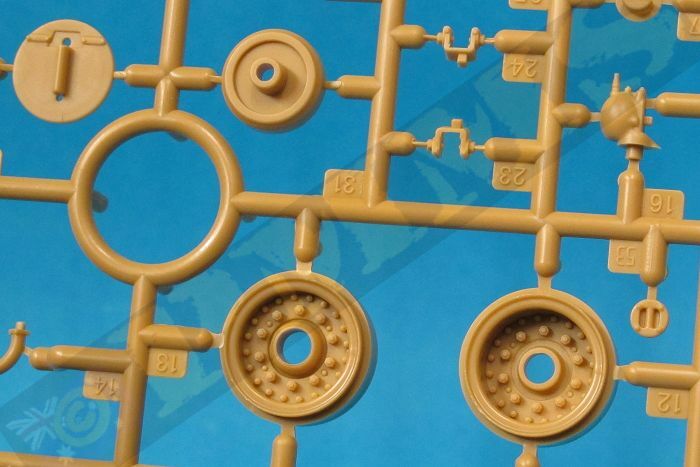 there are three sprue A, two sprue B and two sprue H so you need to take care to find the right part on occasions, especially with the suspension parts. 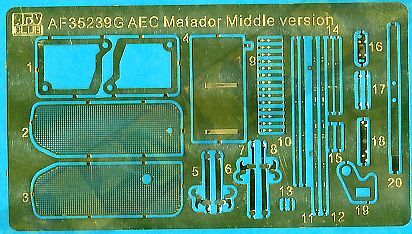 The Early Matador kit (AF 35236) instructions had a number of part numbering errors as indicated in the review of that kit and thankfully all of these have been corrected in this kits instructions, so you can just dive without hitting any such snags. 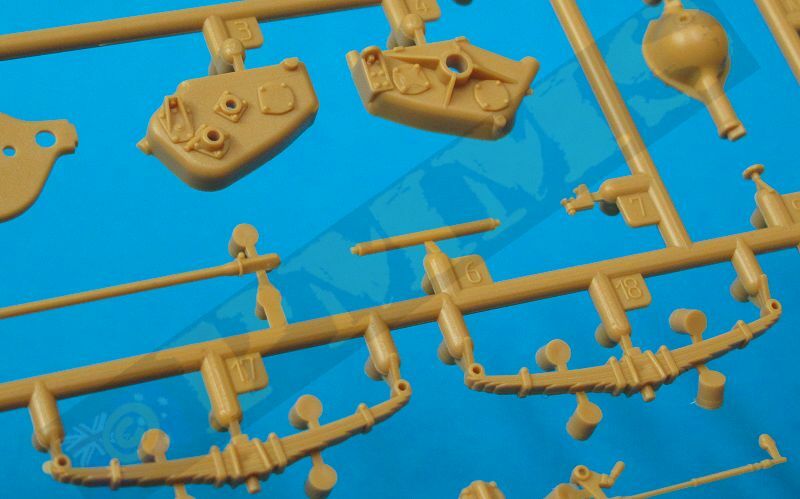 The standard of moulding is extremely high with clean crisp details on the chassis/suspension and body parts as well as the many very small plastic parts that will need care removing from the sprues and during assembly to avoid damage. 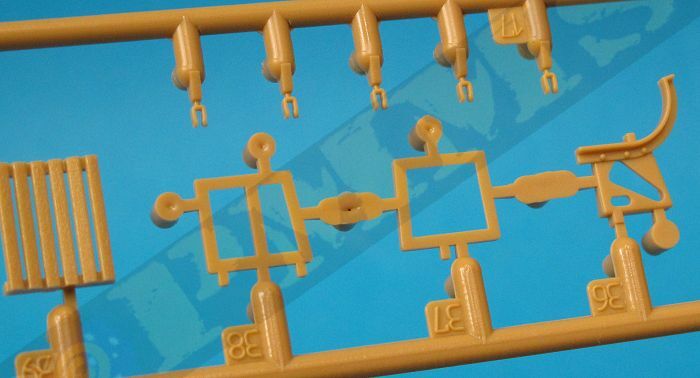 There is some fine flash on some parts that’s needs attention but the pin marks are kept to a bare minimum through the extensive use of the knock out nodes now common on kits. 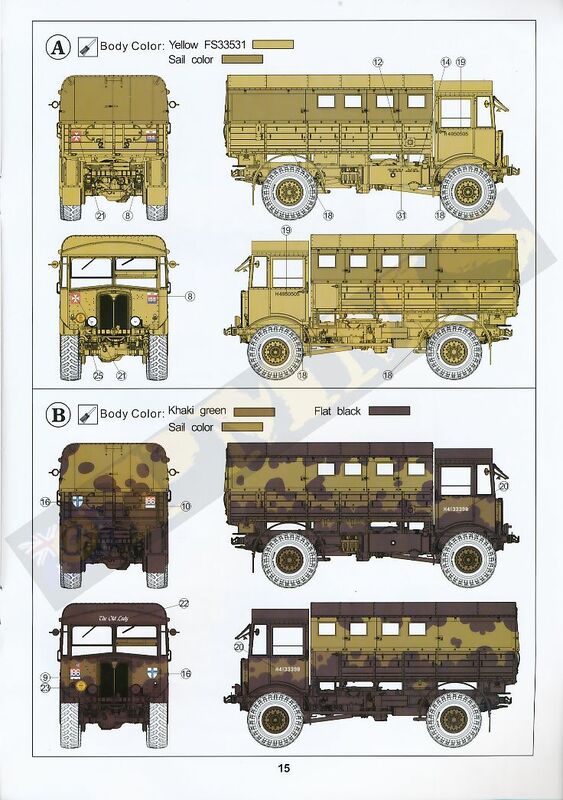 As this kit is basically the same as the previous Matador kit the comments below are mostly from the previous kit review with some amendments and additions for the new cab and roof parts as applicable. 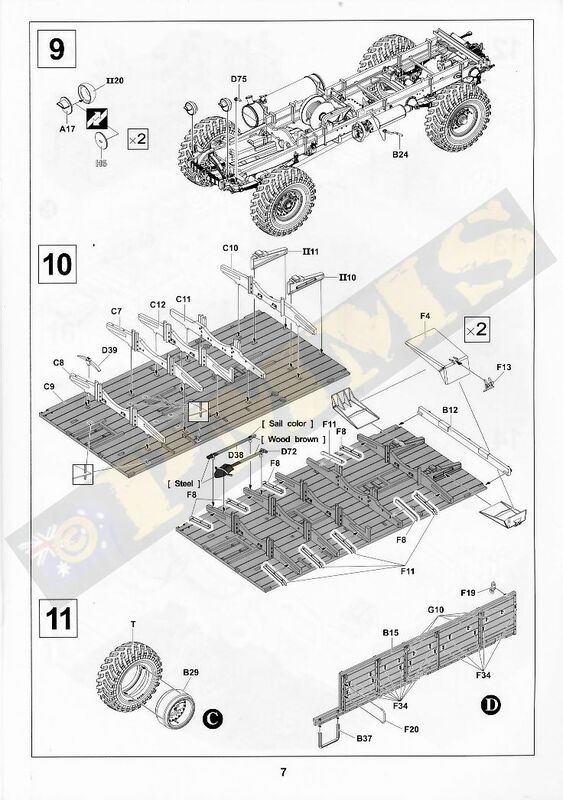 The chassis has the two side U frames separate with numerous cross members (note there are a few chassis frame modifications required before assembly, (see image) along with the engine underside oil pan and gearbox (which is the only engine detail included in the kit) as well as the winch sub-assembly and they all need to be aligned as the two chassis frames are fitted. 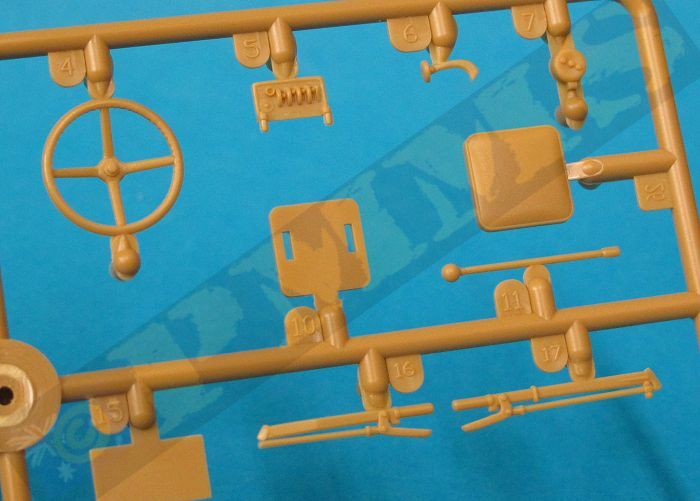 This is made easier by gluing the various cross members and front engine under pan to one of the chassis frames ensuring they are all fitted perfectly square and level. A point with the winch assembly you should shorten the pin on part A53 to allow this to fit against the transfer case fitted later, or open up the locating hole for this pin in the transfer case. 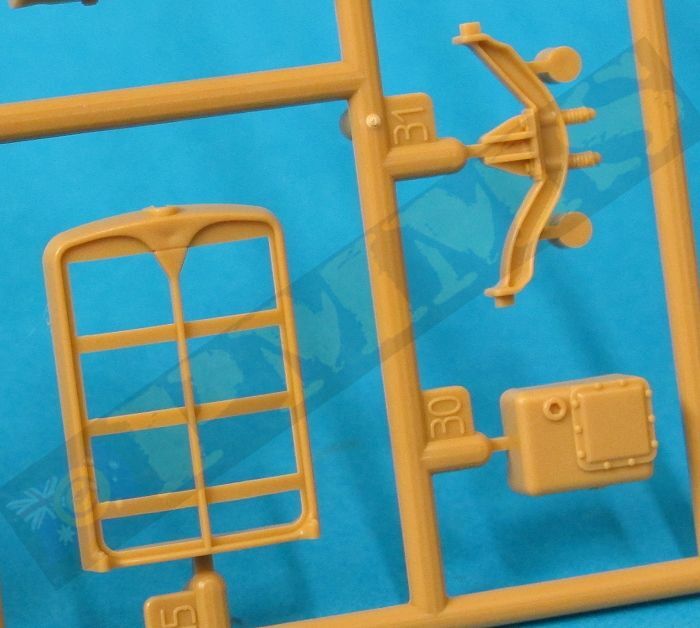 A couple of things to watch here is the front curved cross member (part I31) has a large pin on the rear side that needs to be removed and there are pin marks along the insides of the chassis frames that can be left as they can’t be seen after assembly and don’t impede assembly. The other chassis frame can be glued in place ensuring the cross members sit snugly in place which wasn’t a problem due to good fit. 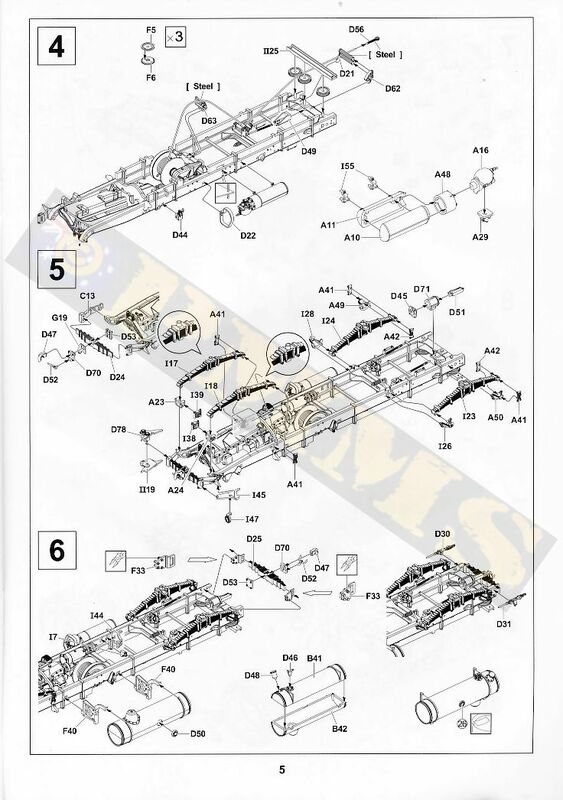 Added to the inside of the left chassis frame is a small transfer case mounting (part I7) but this is best left off until after the transfer case is added later as it makes fitting the transfer case quite tricky if fitted beforehand. 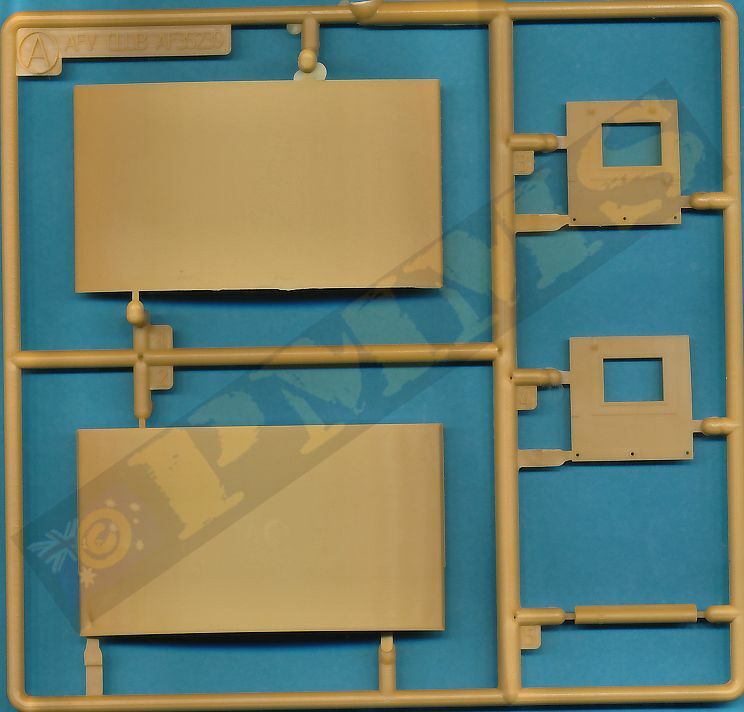 Other larger items added are the compressed air tank and large fuel tank and these all fitted together very well although the air tank guard is very thin and needs care removing from the sprue and in fitting. There are three winch cable guide rollers added to the rear of the chassis but the outer rollers are hard to fit due to small tabs on the end of the chassis beams and I had to bend these out of the way to fit the rollers and then reposition the tabs, nothing to exciting. 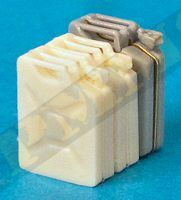 There are numerous small delicate items added such as the rear brake cylinders, winch cable guides and with due care these all fit okay. 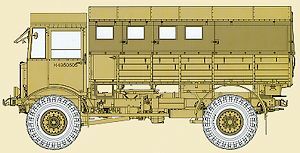 Added to the front and rear of the chassis are the two leaf spring mounted tow hooks fitting into brackets on each chassis frame. 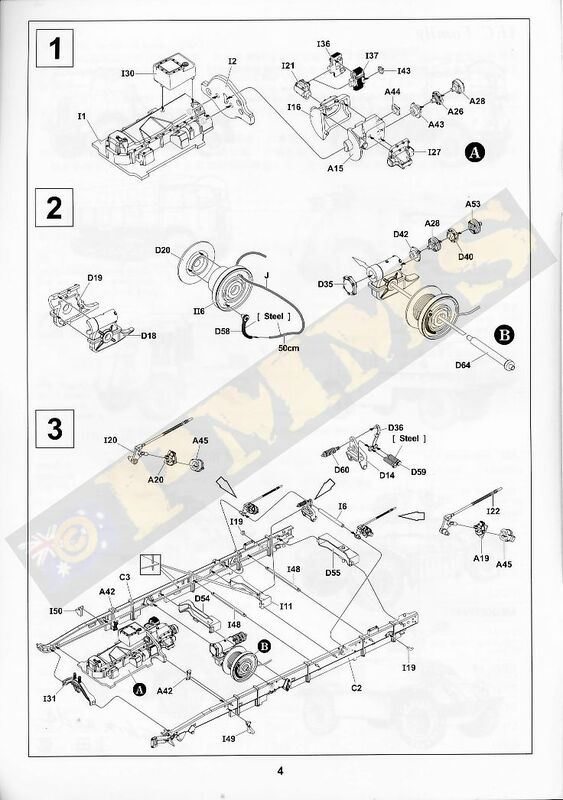 Assembly of the spring tow hitches is fairly straightforward but the rear spring has two small mounting brackets fitted to the ends of the chassis frames, each bracket has four mounting pins with the instructions showing to cut off one of these pins before fitting. 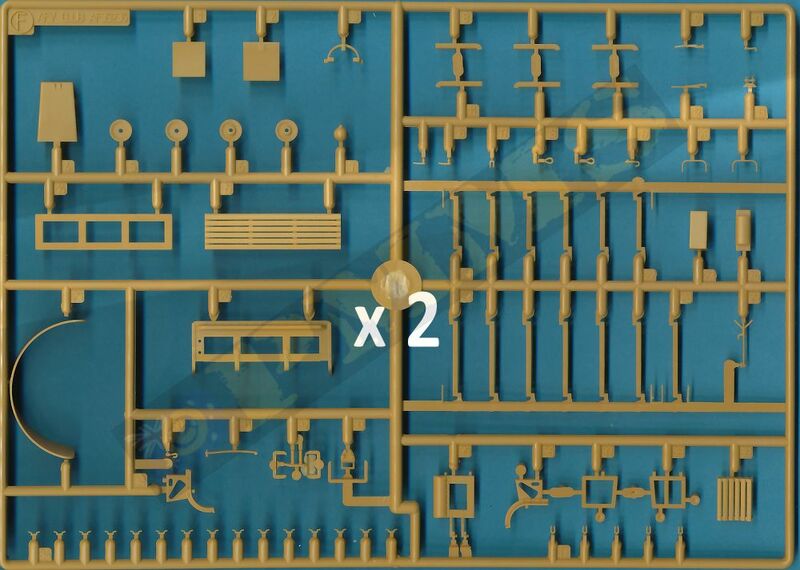 I found it easier to actually cut off two of the pins leaving just two diagonal pins that correspond to the larger holes in the chassis frames. 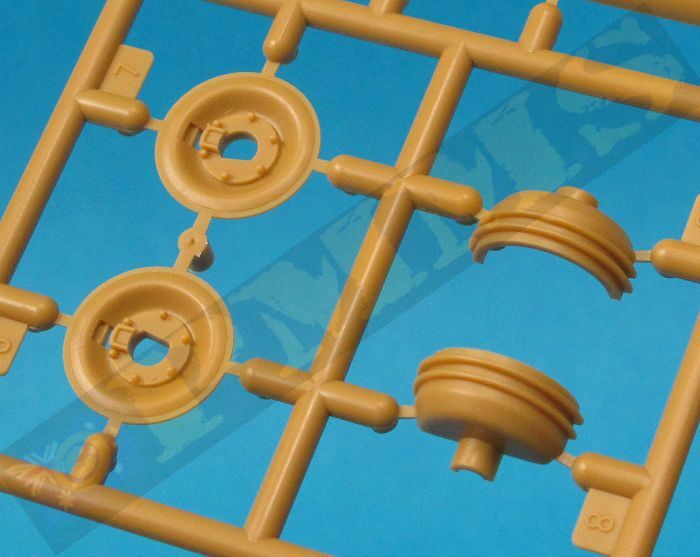 It’s best to glue one of the brackets (part F33) in place and let the glue dry before fitting the spring and other bracket for easier fitting. 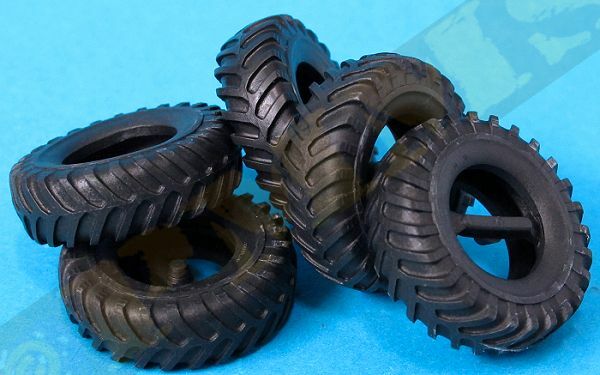 The vinyl tyres are cleanly rendered tread and have very fine tyre dataembossed on the sidewalls. 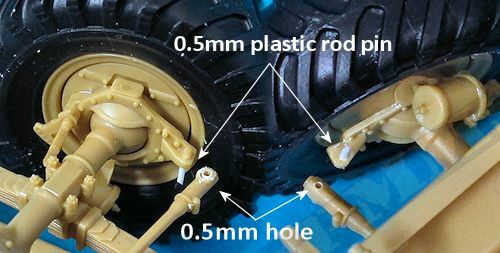 The tyres are slipped over the rims and you can fit the tyre before attaching the rims to the axles to make this a little easier if you wish? The assembled wheels are fitted to the wheel mountings (parts A38, A39) and if you want the wheels steerable make sure not to get glue on the axle stubs in the process, this is a fairly easy job as the parts are quite large making handing easier. 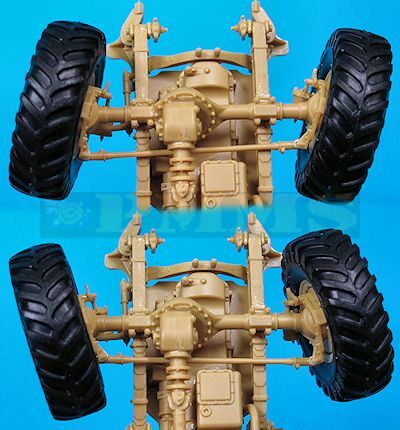 The rear wheels are similar with 3 part brake drums and the wheel rims held in place by the outer bolt ring and hub cap (parts A47, A40) and again the rims can rotate if careful with the glue, the assembled wheels just glue to the axle stubs with the inner linkages added (parts I41) for quite robust and detailed suspension assemblies. 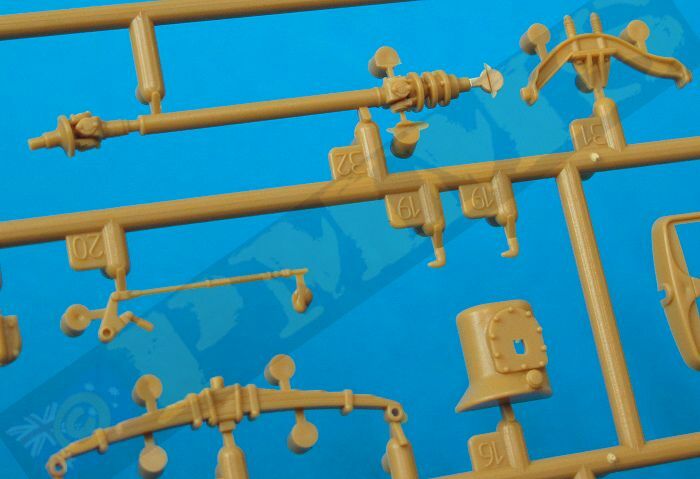 The four part muffler assembled easily and has a redesigned exhaust pipe making fitting easier than with the first Matador kit. 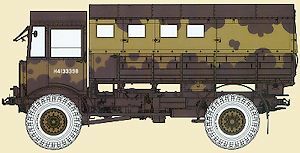 The final items added to the chassis are the front mounted horn and head lights with the option of clear glass or blackout covers, these would be the preferred option for wartime vehicles. When fitting the separate blackout face you need to make sure this is set at right angles to the lower light mounting post as there are no locating tabs for the covers. 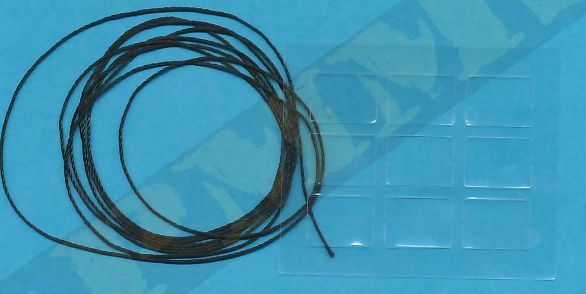 The rear wall has extensive ribbing included as well as seven small raised pins that need to be trimmed off before assembly, (see image d32) there are also some pin marks in-between the ribbing but only one (top left corner) is visible after as the other details added cover all the others so there is no need to worry about these. There is a large four part electrical control unit added to the right side with the cable cover fitted below, this unit has switches such as start, side/head light and battery cut-off switches, as well as the seven part seat and seat support and the padded seat backrests added to the wall. 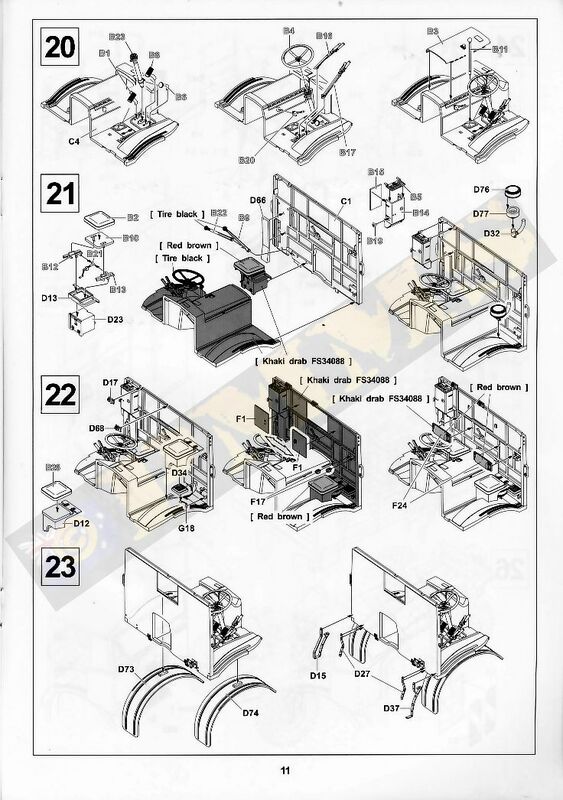 Care is needed when fitting the seat supports (parts B12, B13) as these trap the seat adjustment crank (part B21) between them but the rest of the seat assembly is straightforward with the assembled seat added to the lower wall. 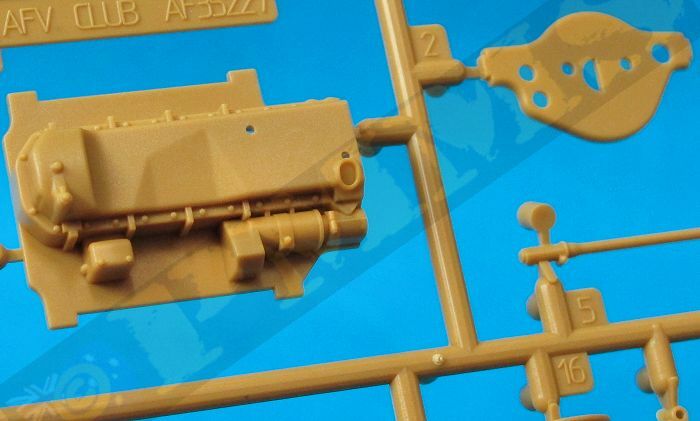 The large front cab wall (part B26) is a single moulding that includes the side panels and the windscreen/window frames, the sprue attachments don’t overlap the window recesses like on the earlier cab so clean-up is a lot easier. 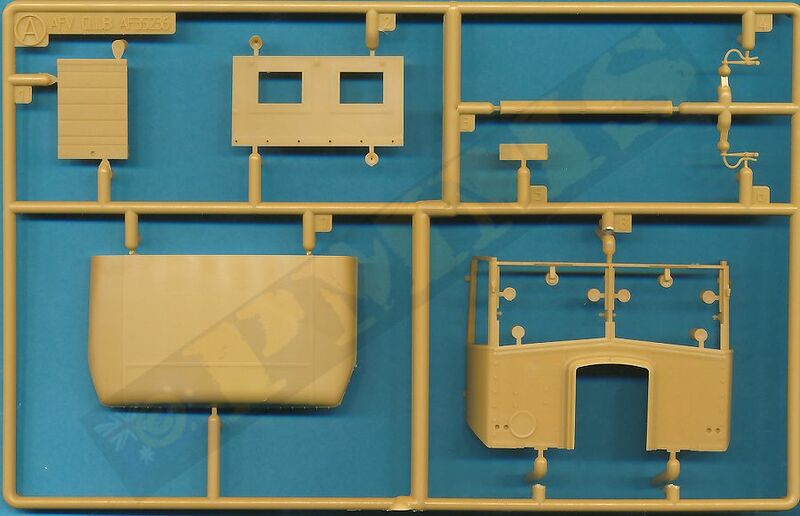 The cab has excellent surface details included on both sides as well as the radiator mounting on the front; the radiator housing is separate and has two fine PE mesh grills that fit into the housing as well as a separate top filler cap. 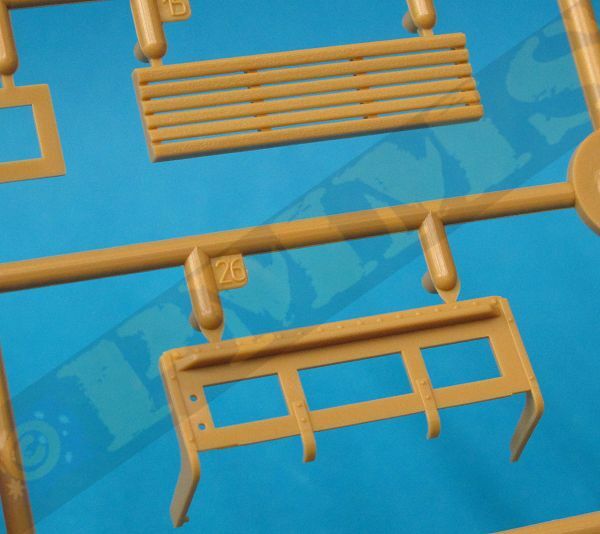 There is a small sink mark at the top of the housing between the grills that should be easy to eliminate. 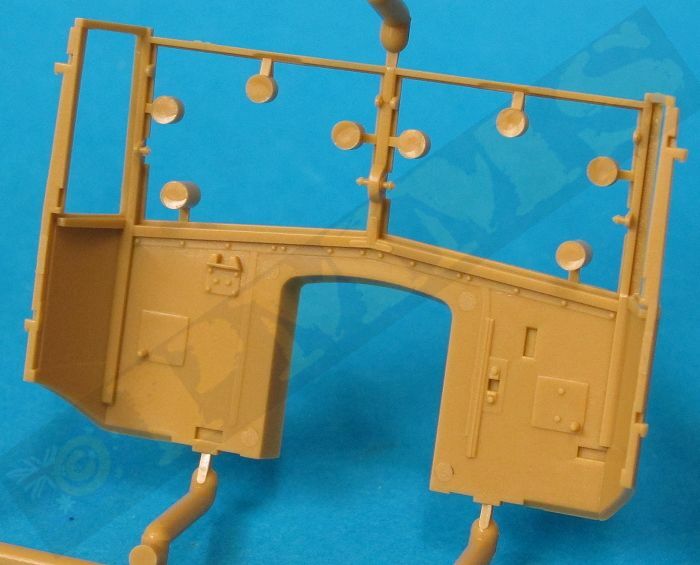 Another thing to note is there is no actual radiator behind the grills and from front on is very see-through so blanking off or making a radiator front for the insides could be an option? 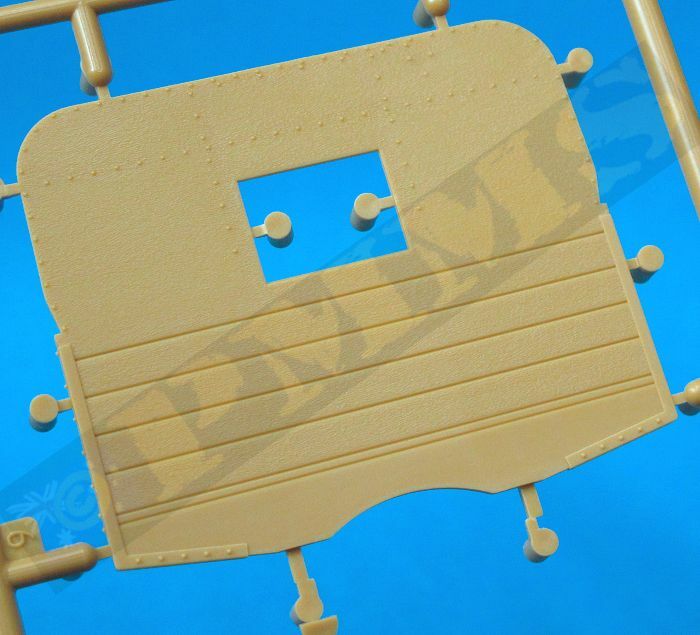 On the inside of the wall is the instrument panel with decal dials but the fit of the panel needs the lower inside edge trimmed a little to fit the contours of the engine compartment properly when fitting the wall to the floor, test fitting will determine to amount to be trimmed. 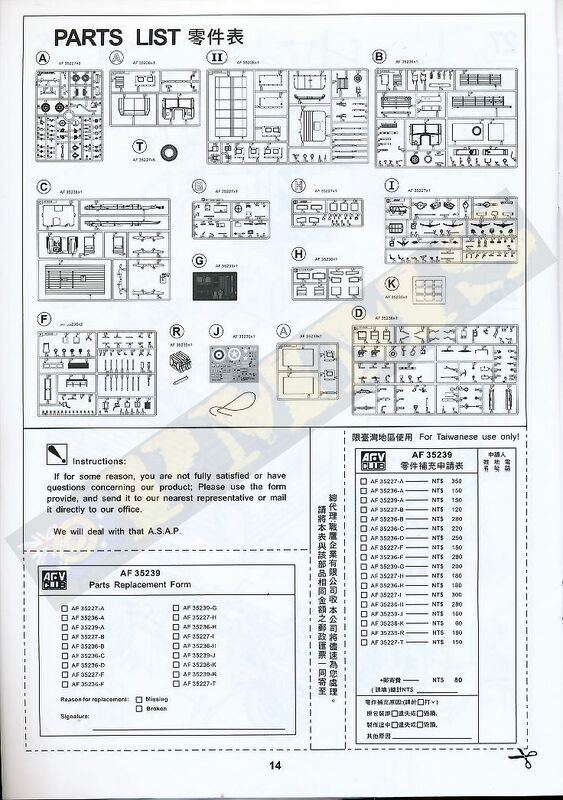 Also included is the brake controller under the instrument panel (part B7) and also a fire extinguisher with mounting on the right side (part B27). 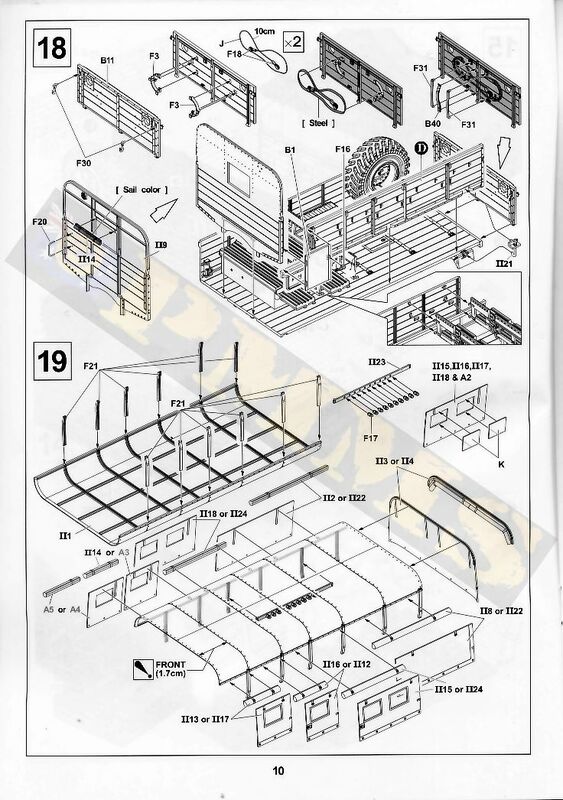 The main windscreens are in two parts either side with the fixed lower section and separate top section that can be positioned open closed, there are also fine PE brackets for the windscreen depending on the window position as well as wiper motors added to the inside top of the screens and I have fixed the left side windscreen open to illustrate this. 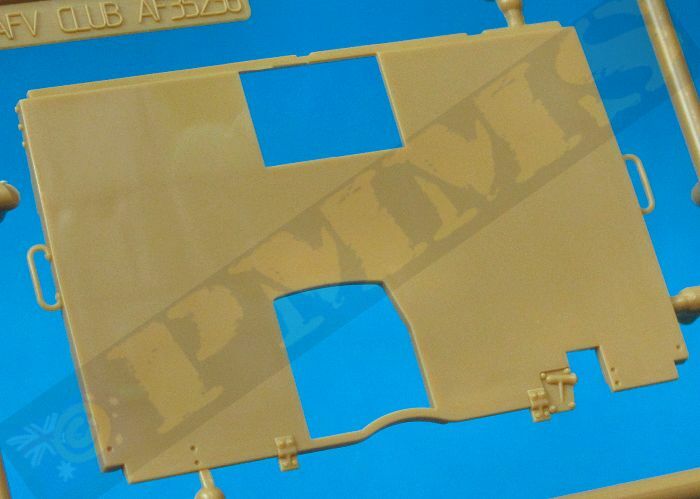 The two smaller side windows have the part numbers transposed, part H7 should be H6 and H6 should be H7 with the fit good after putting the windows on the correct side. 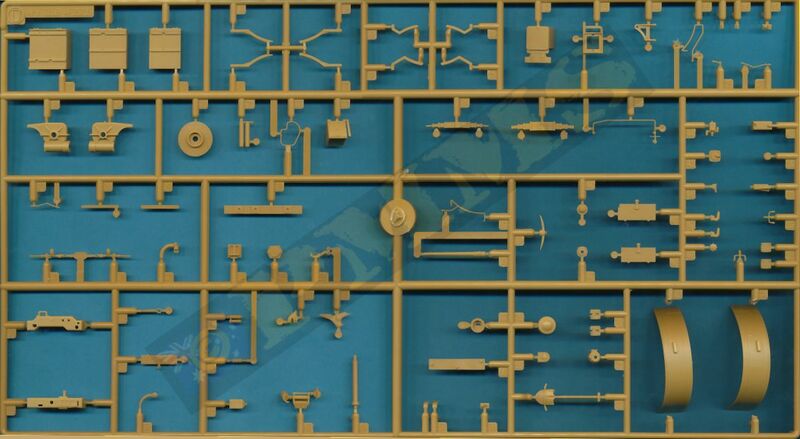 There are separate central door hinges supplied, one if the door with fitted closed (part D16) and another if fitting the door open (part D67) so you should choose your preferred configuration and fit the appropriate hinge. 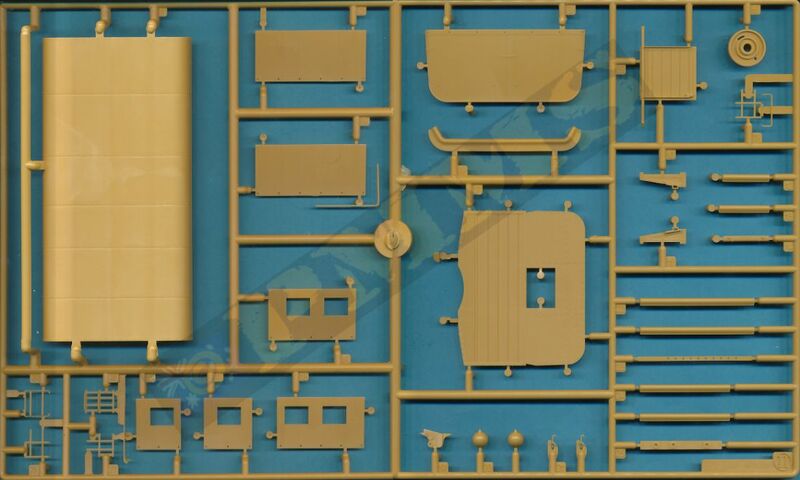 The doors themselves have separate inner wood panels with very fine plastic door handles and window winder handle as well as fine PE grab handle for the inside that needs careful bending as there are no engraved bend guides included. 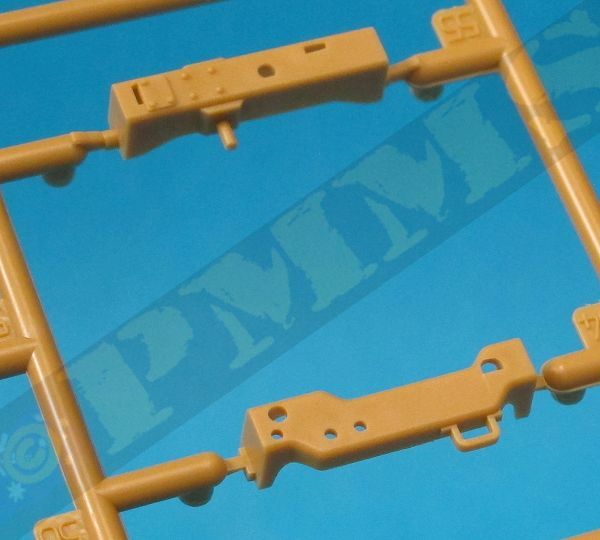 There is alternate window glass one full closed window and a partially open window for nice variation and again you simply choose you preferred option with the fit of the clear parts into the window frame being very good. 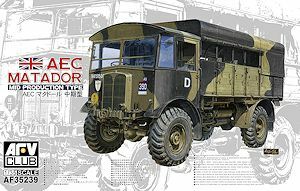 The fit of the front cab wall to the floor is excellent providing a very snug fit and when fitting the door in the closed position there is a large gap under the door and along the front edges, these gaps should actually be there and is not a fit problem as referring to any reference photo of the Matador will show. 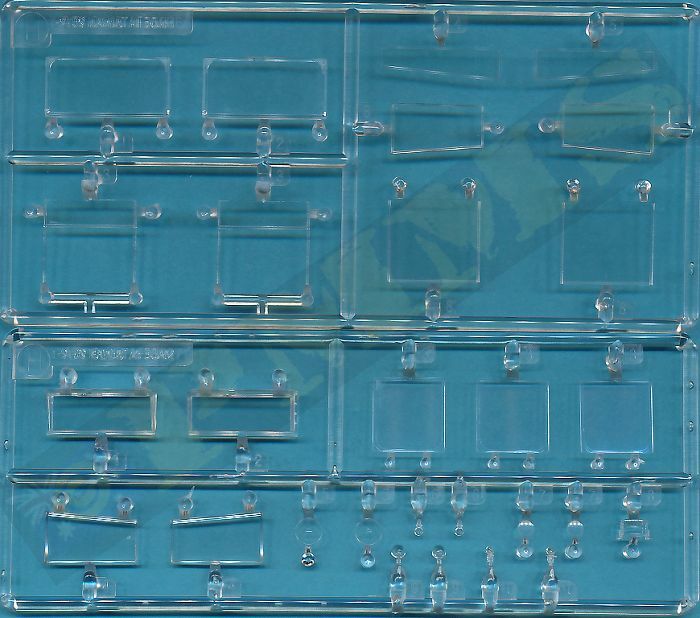 The final items added to the cab are the plastic windscreen wipers, rear view mirrors and small side lights, the mirrors and lights are best left till last as these can easily be damaged during handling if not careful. The new curved roof (part A2) with separate thinner top roof panel (part A1) is provided and the top panel has bevelled edges to give the appearance of the spacing and thinner edge but the bevel is quite steep and by reducing the thickness of the inside plastic for a more shallow bevel as well as thinning the edges of the roof a more realistic appearance can be achieved. 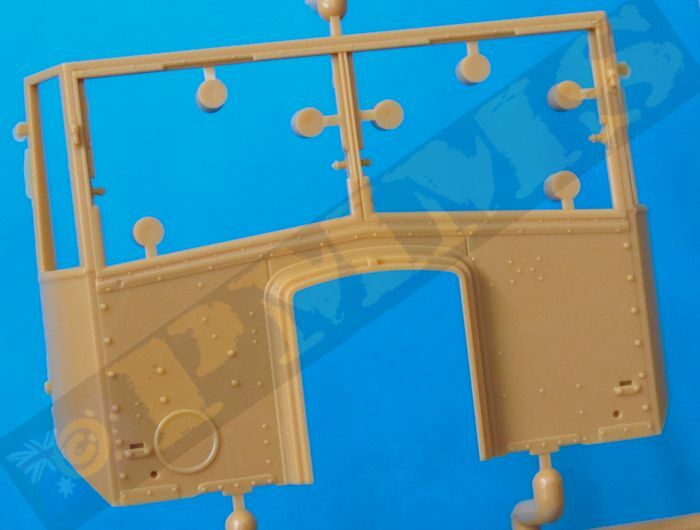 Another issue to watch for is along the outer curved rood edges is a row of very small rivets that unfortunately have a mould line running through the rivets and very careful clean-up is required to remove this mould line while not damaging the rivets. 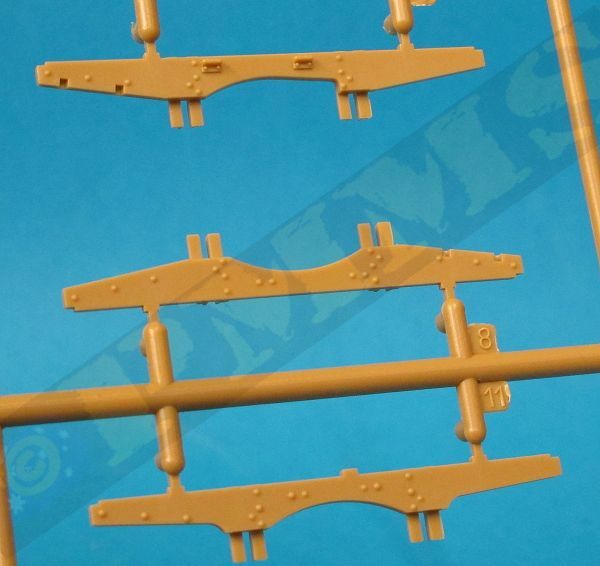 If you do accidentally remove some rivets on the process replacing these with Archer Surface Detail rivets would be an easy solution. 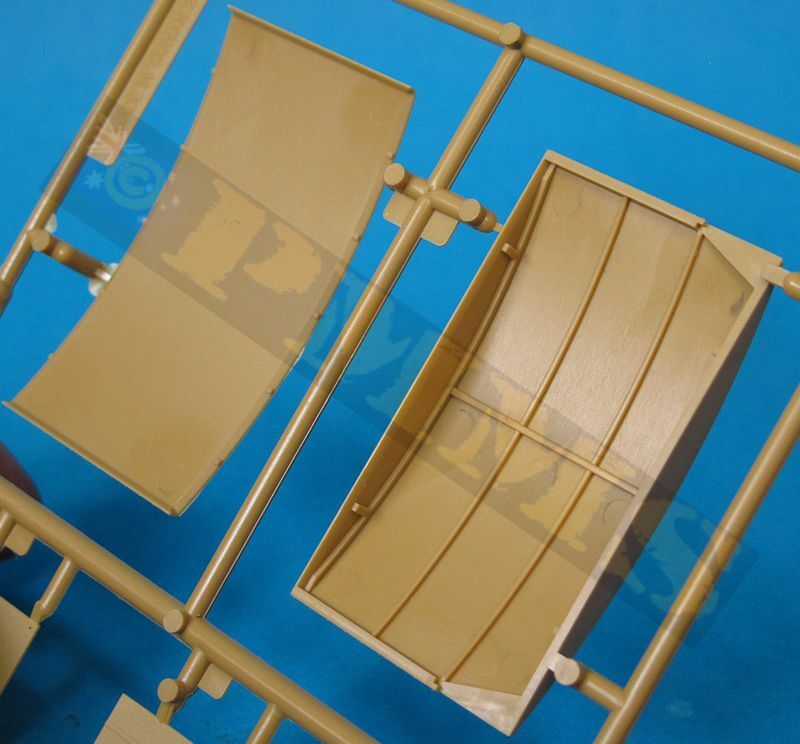 The two roof sections fit flush together, just make sure the front and rear edges are level as there isn’t any actual locating tabs but this is easy enough to do with the assembled rood fitting neatly to the top of the assembled cab. Fitting the assembled cab to the chassis is fairly straightforward but I did slightly reduce the thickness and also bevelled the top edges of the chassis mounting brackets (parts I49, I50) to allow these to fit into the locating holes on the underside of the cab easier, this was only minor trimming so don’t remove too much plastic from the mountings. 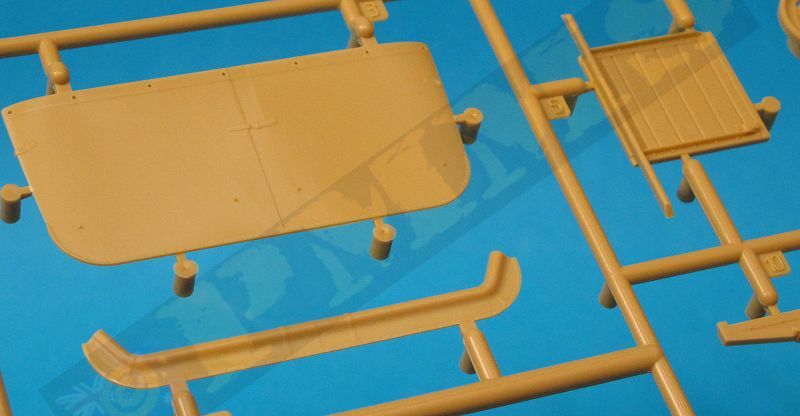 The two bracket parts F32 fit around the lower front cab tabs that sit on the front of the chassis frame for a snug fit. 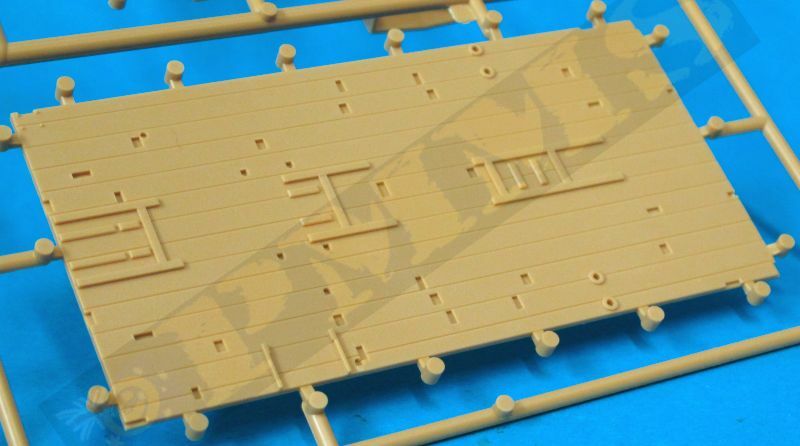 Care is needed removing parts F32 from the sprues as they do have quite extensive excess plastic around the brackets and it can be hard to see what the part is and what is excess plastic if not careful. 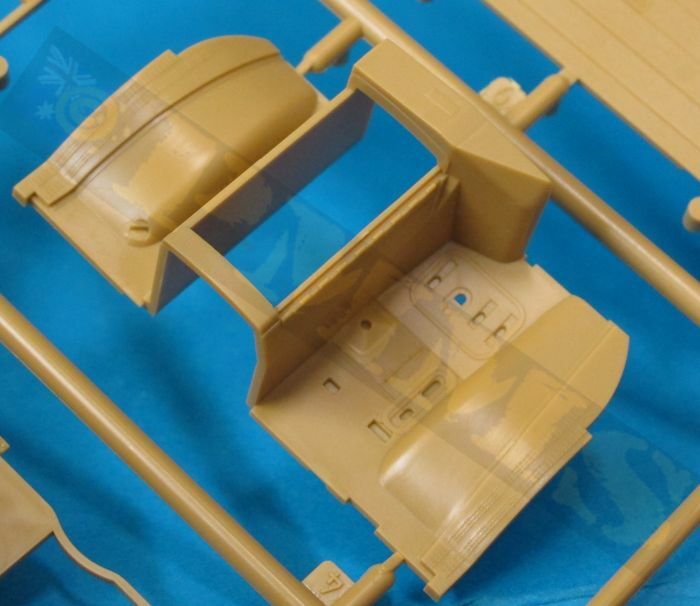 Of note is that the later style spaced roof with the open round hatch over the passenger position is also included (part B27) as is the half section of upper spaced roof (part B28) but these are not shown in the instructions as I presume intended for the Later Production Matador kit to come. 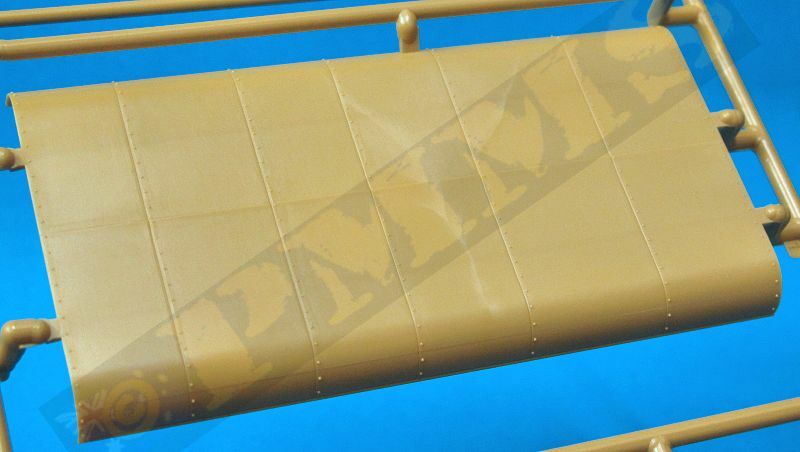 But some photos exist of Mid Production trucks being fitted with this style of roof so the option is there if your wish? 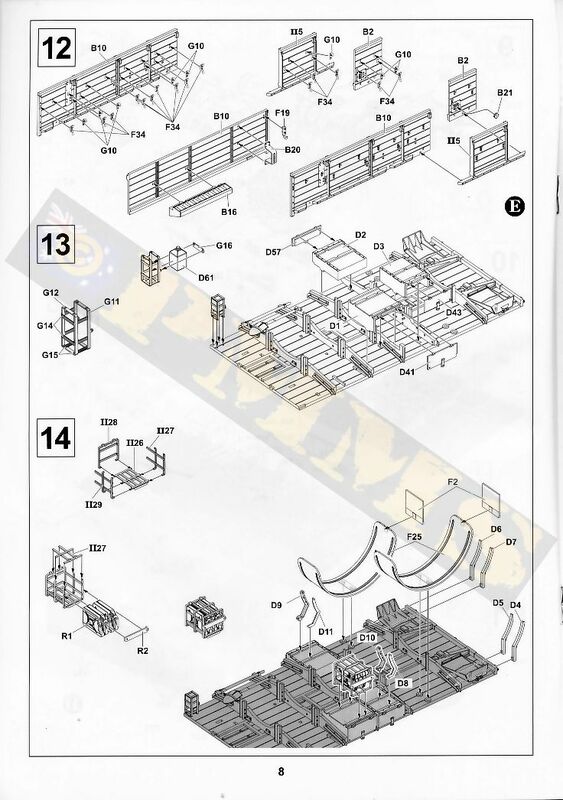 Before starting there are some locating holes in the floor that need to be opened up, these are shown in the instructions (Step 10) and once done the cross member supports can be added taking careful note of the part numbers for each support and the direction for fitting the supports as C11 is fitted the opposite way around to the others. 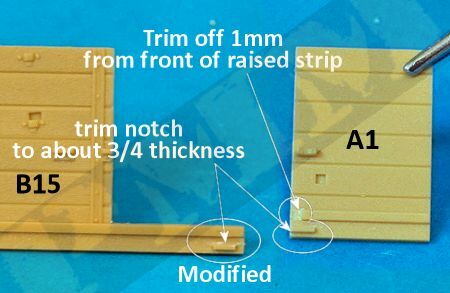 Added to the supports are small bolted strips and again you must watch the part numbers as there are two F8 and F11 with only very subtle differences so follow the instructions closely when fitting. Also added are the pioneer tools, forward edge strip and two parts F4, these can be left off until the side panels are fitted as the small central end bracket must align with the hook on the sides. 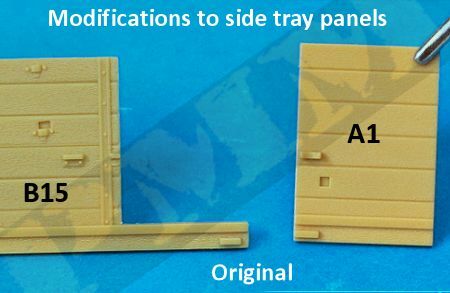 The two side panels again have excellent surface details with subtle wood grain and nicely rendered support stringers with rivet details, the left panel has a separate front entry door with separate handle and this can be fitted open or closed as you wish. 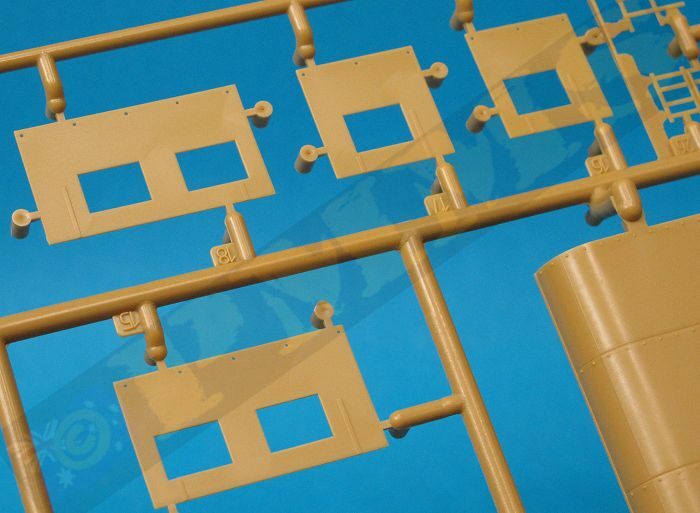 The right side panels is made up of three parts, the main panel and two forward sections that are fixed into place and it’s best to glue these together to form the side panel before fitting to the floor for easier fitting. 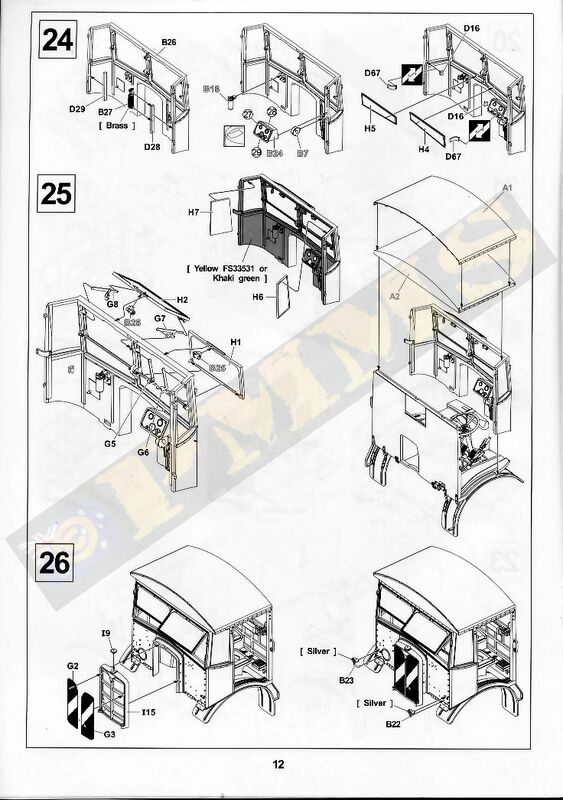 These parts are separate due the later production truck having a metal entry door on the right side which is not included on the early/mid production trucks. 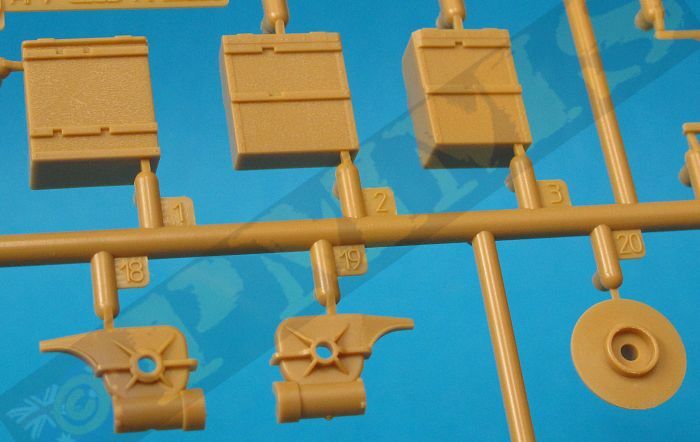 The kit provides two Jerry Cans moulded together in resin that also include the fine grab handles so apart from removing the casting block there is no other clean-up required. 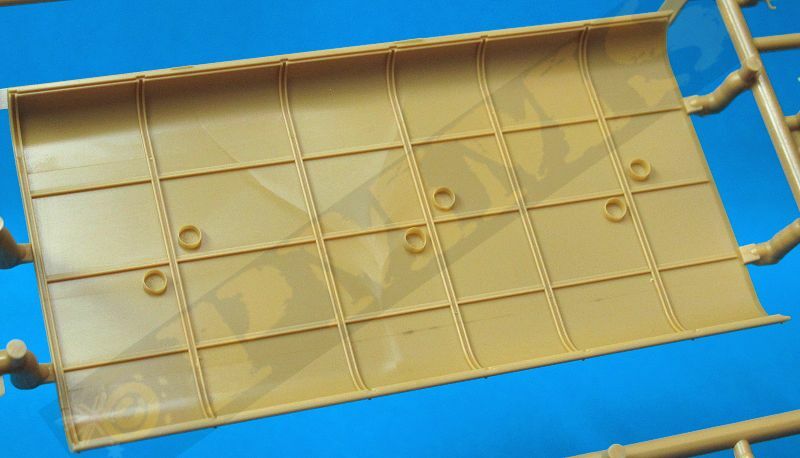 These new resin Jerry cans are again too short in height by about 1mm as were the previous plastic ones, the other issue is the corners of the cans are cast quite sharp and you will need to round these with a some light sanding for a better appearance. 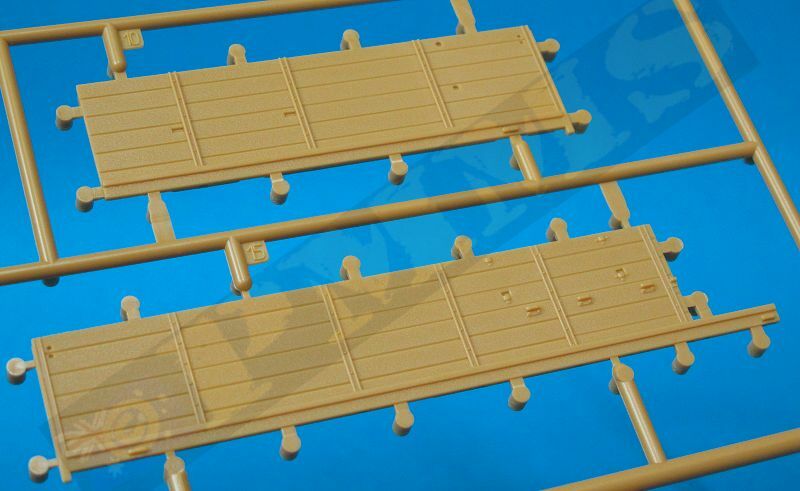 But with these Jerry cans fitted inside the under tray rack the height issue isn’t really obvious and these should do the job adequately, just use other proper sized Jerry cans if you wish to have these out of the racks in a diorama setting. 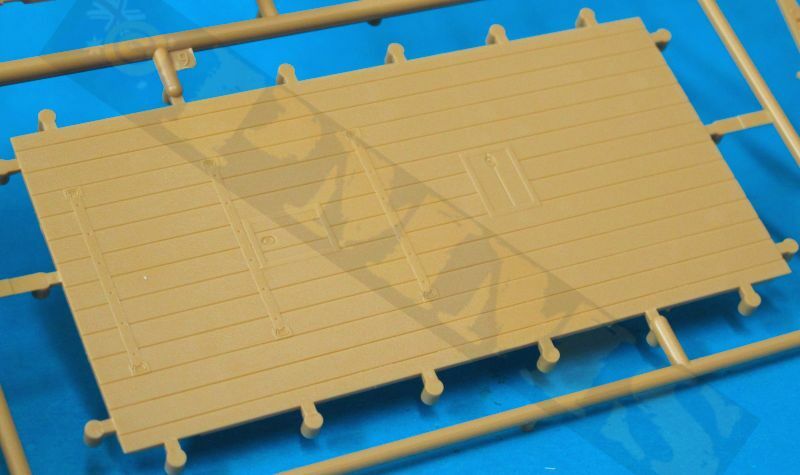 You may wish to fit the assembled rear cargo tray to the chassis before fitting the full metal roof as is a very snug fit and a bit of coaxing may be needed to get this into place. The reason I advised to cut off the four small lugs from the chassis frames at the beginning is because these are supposed to be locating lugs to get the tray in the right place on the chassis but AFV Club forgot to add the corresponding locating holes in the floor so they actually stop the tray fitting properly, hence their removal. To aid in fitting I bevelled out the ends of the locating brackets on the underside support beams to allow these to slip over the chassis easier as the square ends tend to stick on the chassis due to the very tight tolerances of the parts. Using the position of the fenders and rear wheels as an alignment guide carefully press the tray into position over the chassis frames applying force equally front and rear until the tray sits evenly on the chassis frames, there is no need the glue the tray to the chassis and the fit is tight enough that it’s not going anywhere even if you lift the model. 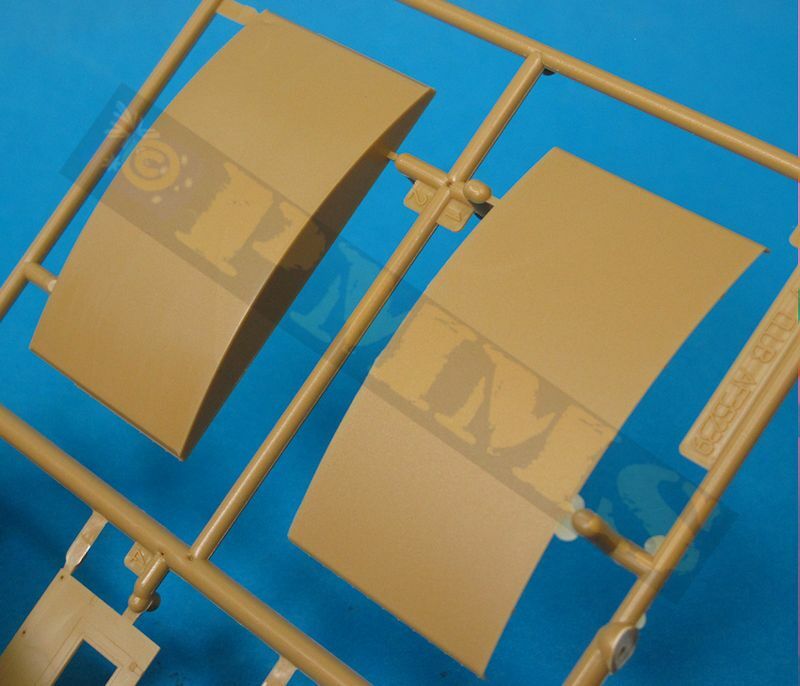 The kit has the full metal roof with side support posts and alternate rolled up or fully extended side canvas flaps for again some nice variation and you can mix and match the rolled up or extended flaps on each side for further variation if you wish. 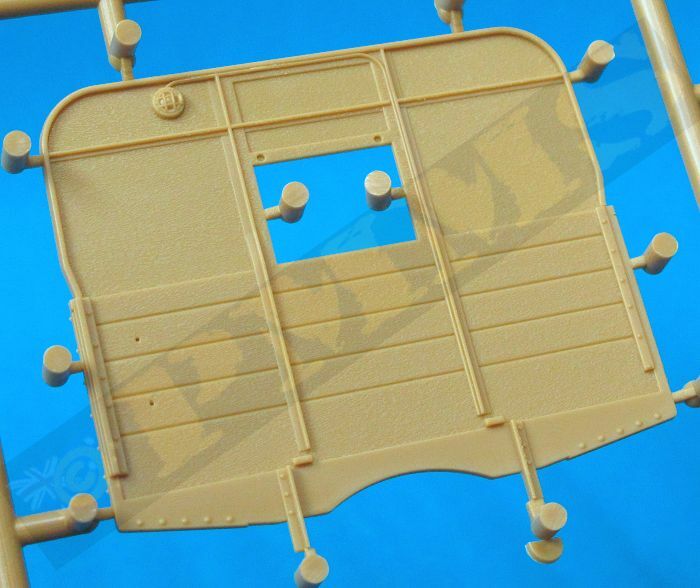 The extended flaps have thin film provided for the windows that give a very good appearance when attached and there is also the securing rope holes included so all you need do is string some thin twine through the holes and around the tie down cleats to complete the detail. You also get a full rear canvas flap or rolled up flap to have the back open or closed along with the sides if you wish. 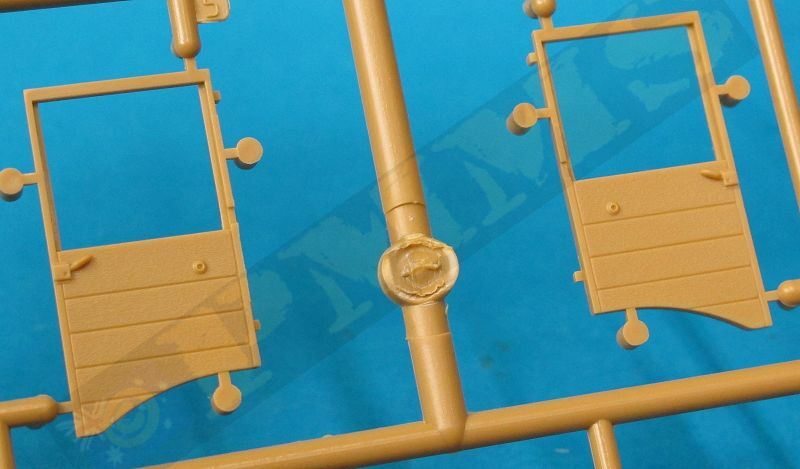 For this kit the right side forward extended canvas sides are in two parts as opposed to the single larger part in the previous kit and this I presume is in preparation for the later Production truck with the right side entry door so you can show just the flap over the door up or down. 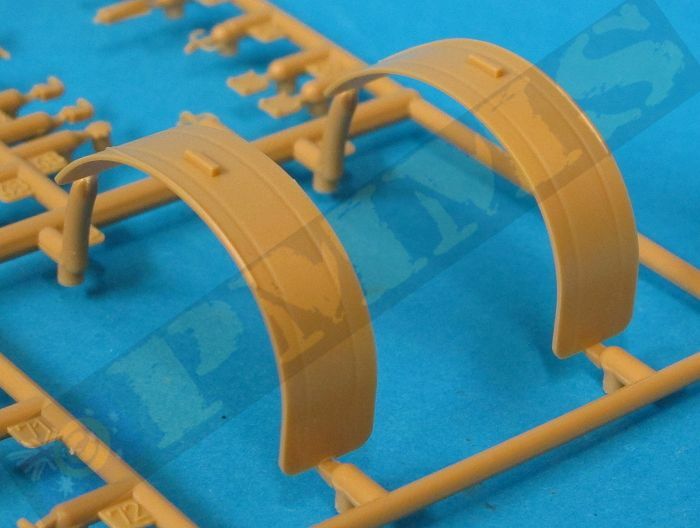 The metal roof has nice panel segment details and fine rivets but there is a largish mould seam line along each outer roof curve that will need to be carefully sanded making sure not to damage the rivet details on the panel joins. 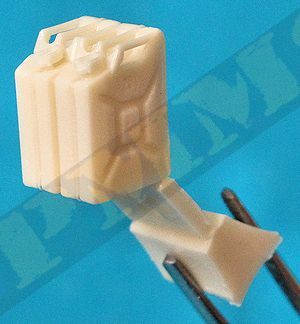 This is in light cream resin with very clean crisp details being basically as you would find in a Hobby Fan resin figures. 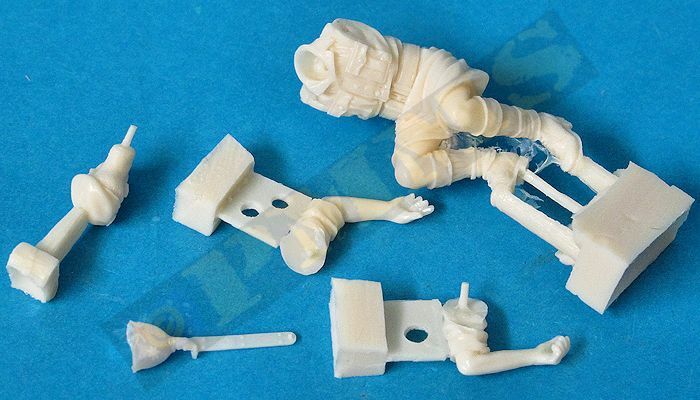 The seated body wearing shorts and tunic has the legs included in the single casting with separate head with beret and two arms with rolled up sleeves. 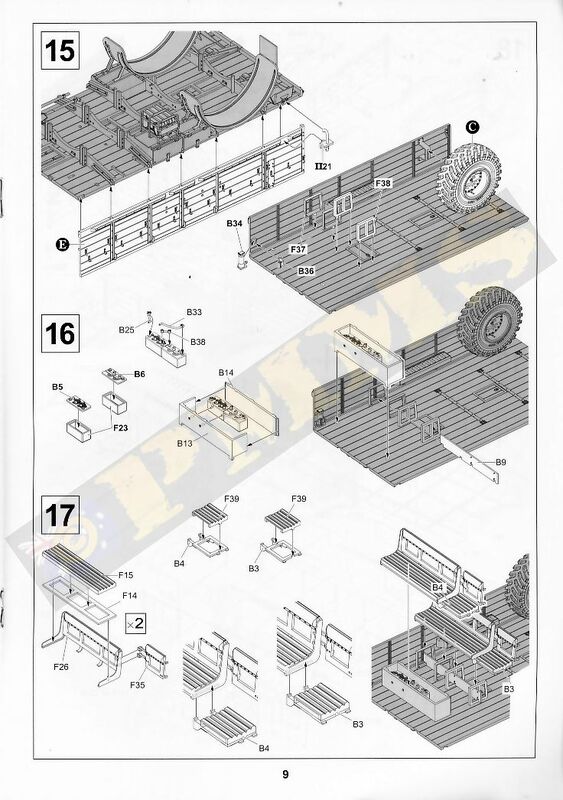 Clean-up is minimal and assembly straight forward and obviously if your are using this figure with the kit it would need to be added as you assembly the cab because it would be very difficult to fit it afterwards, the figure is also not shown in the instructions as its listed as a bonus and presumable will not be included in kits after the initial release? 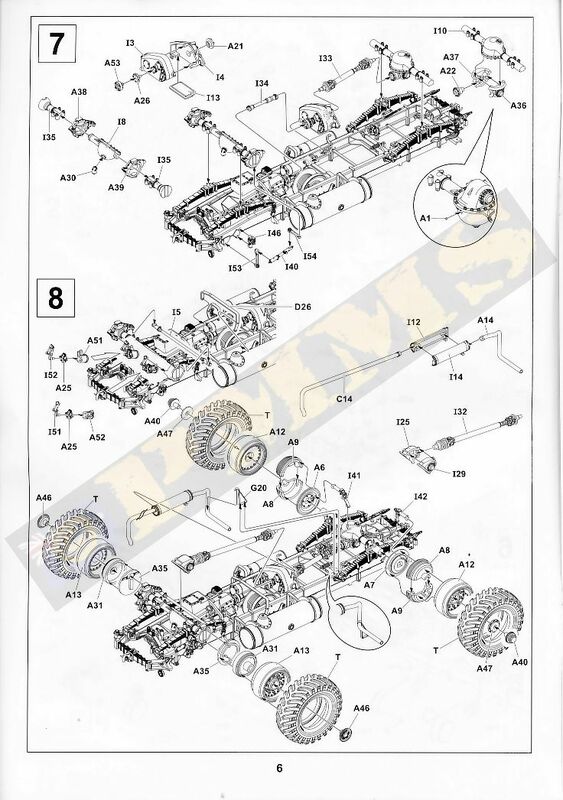 These are the usual exploded view type drawings that have clearly laid out assembly sequences that are easy to follow in the main but due to the complexities of some areas such as the front suspension and those mentioned above so care is needed. 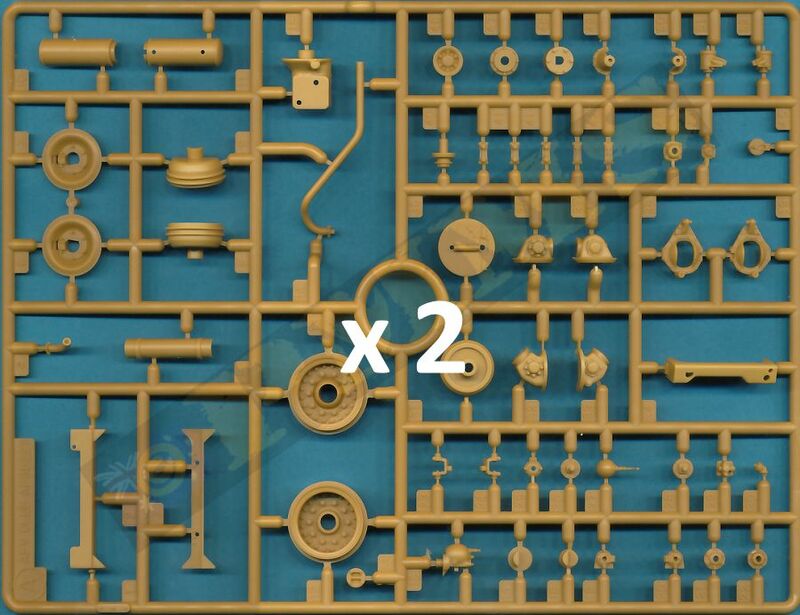 The various sub-assemblies allow you to work on these separate if you wish. 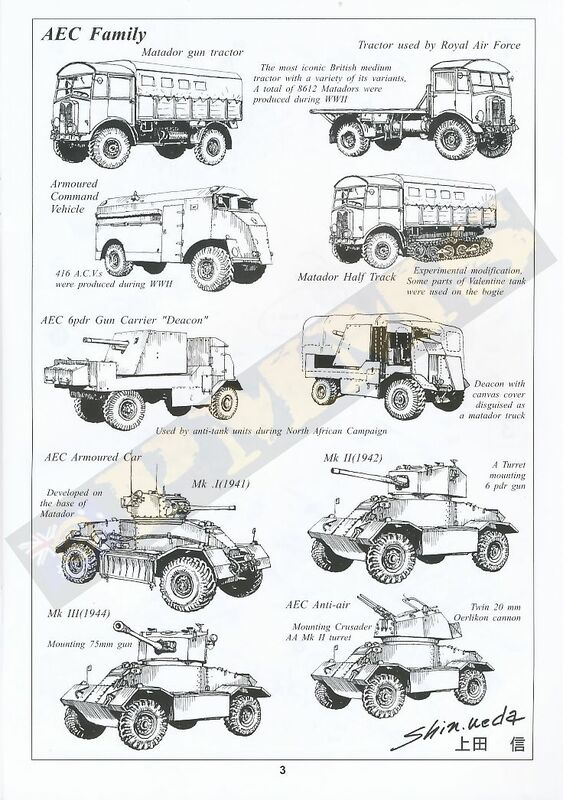 The biggest improvement with the instructions is AFV Club have now discovered colour printing with the front page and the painting scheme guides now in full colour as opposed to just B&W in previous kits and this does make not only for better presentation but the cam schemes are clearer as are the decal placements. 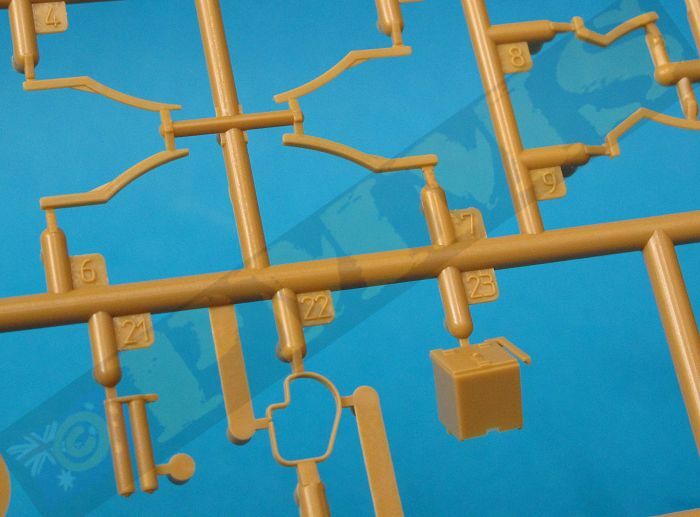 The paper used is also better quality with a glossy finish again giving a more professional feel overall to the instructions. 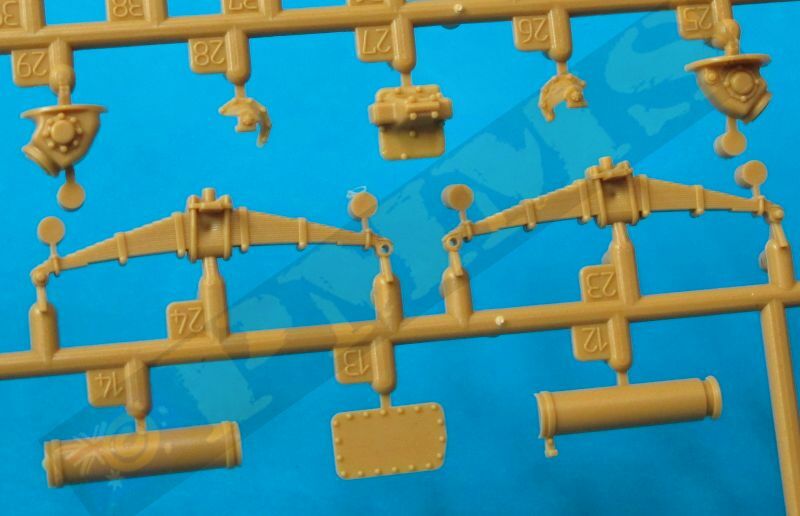 The decals are nicely printed and have markings for three Matadors but no additional unit information is provided. 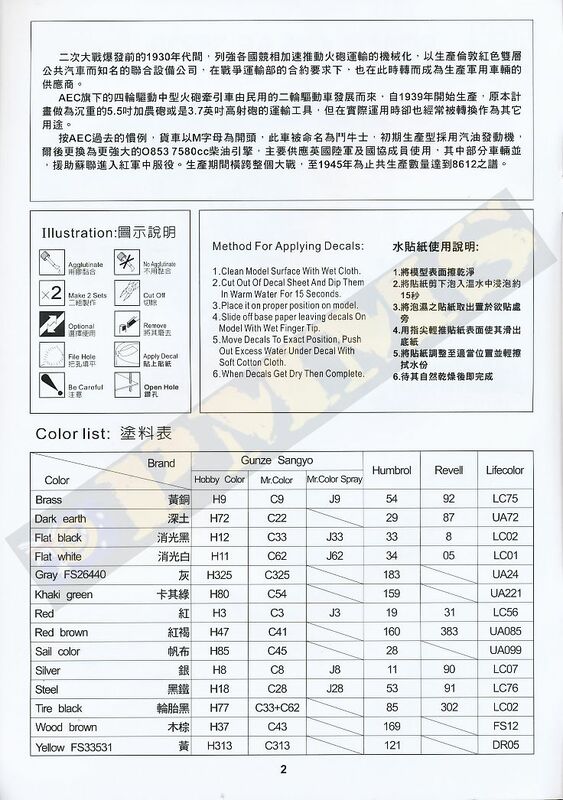 The full colour painting guide has four and five view plan drawings for the three options plus paint numbers for Humbrol, Lifecolor, Revell and Gunze Sangyo. 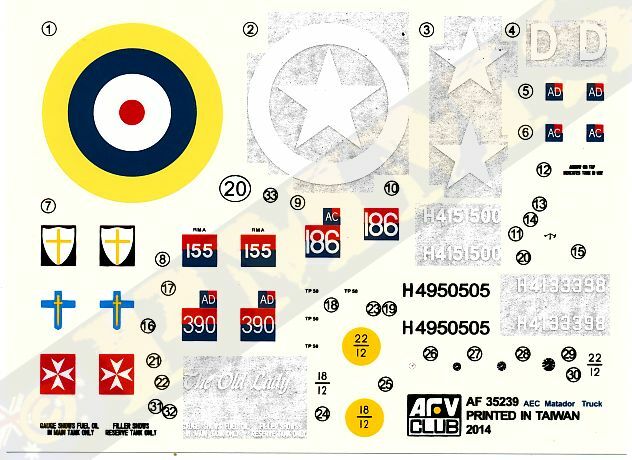 Decal sheet image enhanced to show the white bits. 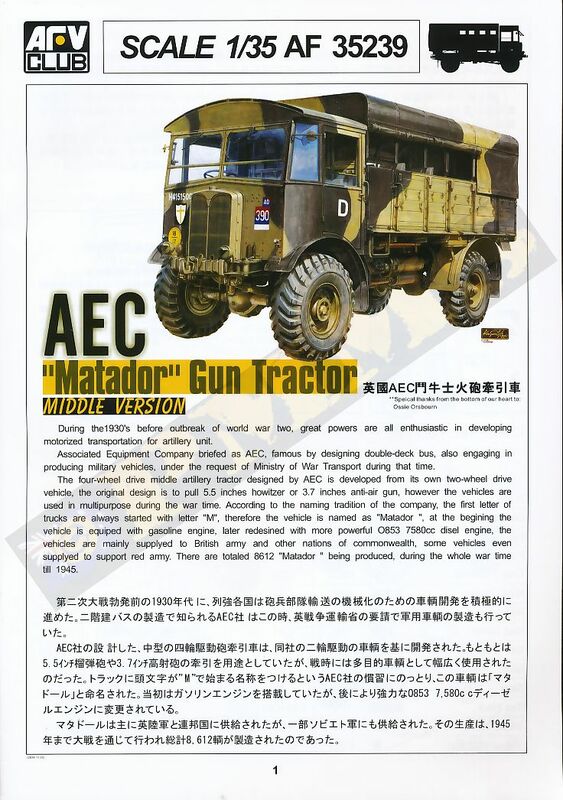 This is an impressive kit of the 1942 production Matador with excellent moulding quality and an impressive level of detail on the chassis/suspension, the cab and interior details with a very busy and complete driver’s station as well as equally impressive rear cargo tray and roof. 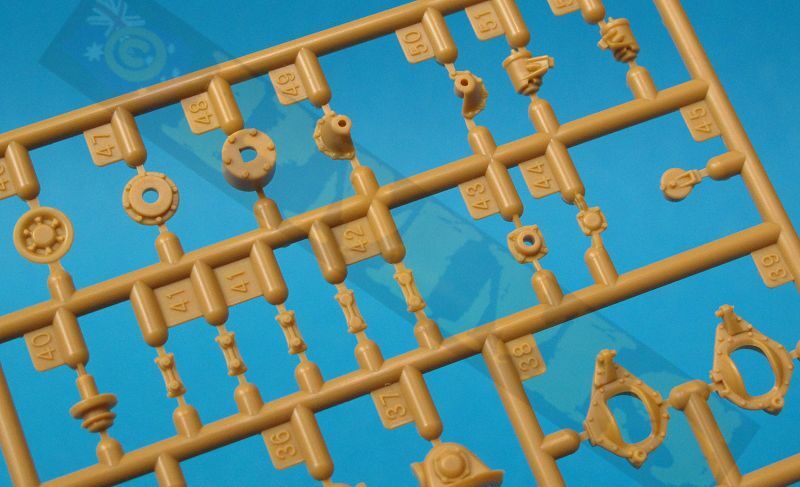 Assembly is fairly straightforward really for such a complex kit due to the overall excellent fit of the parts with only a few minor modifications needed as mentioned above with the instruction bloopers being the largest issue. 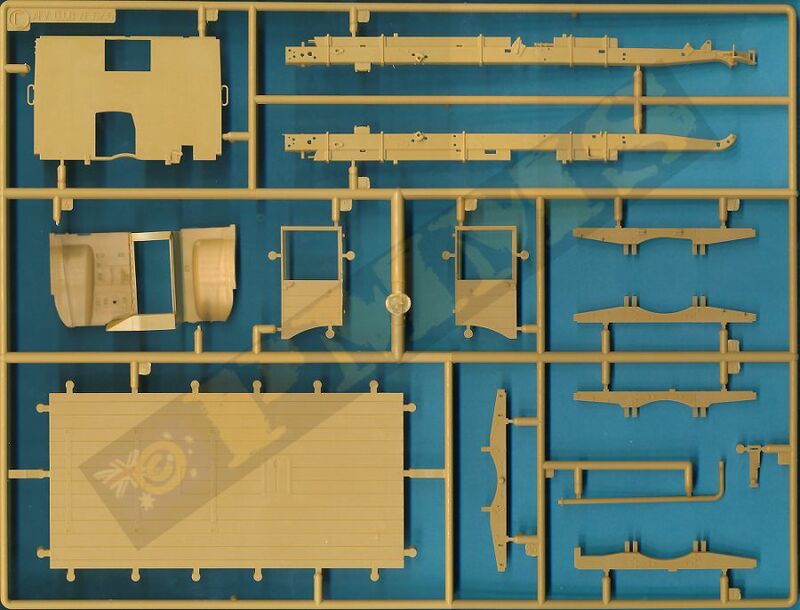 Some of the parts are extremely delicate and need care in handling and during assembly with the kit offering numerous alternate configuration options such as the open of closed windscreens, doors and rear cargo tray side flaps. 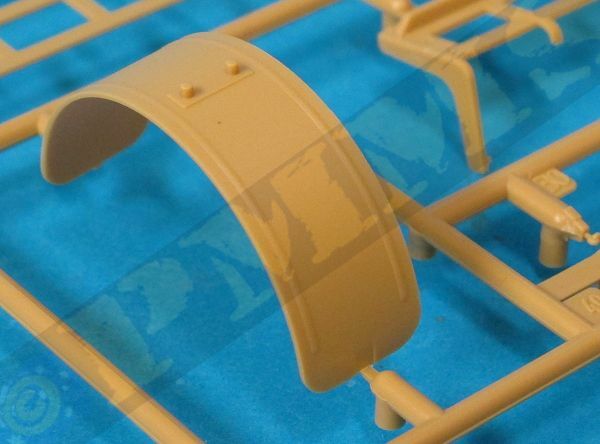 There is scope for adding additional details such as the chassis air and fuel tank plumbing as well as brake lines etc. 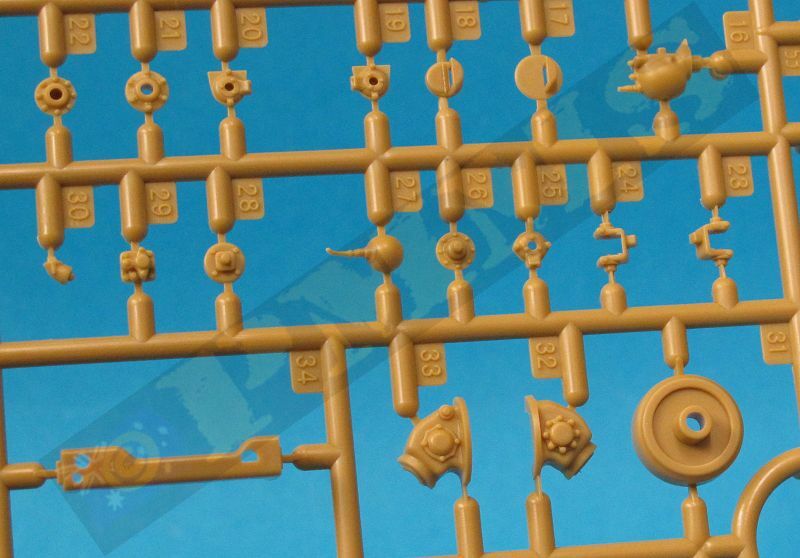 to really detail up the model. 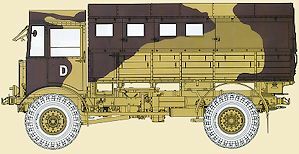 The new roof gives the “classic” Matador appearance for the most widely used version of the truck in just about every theatre of operations. 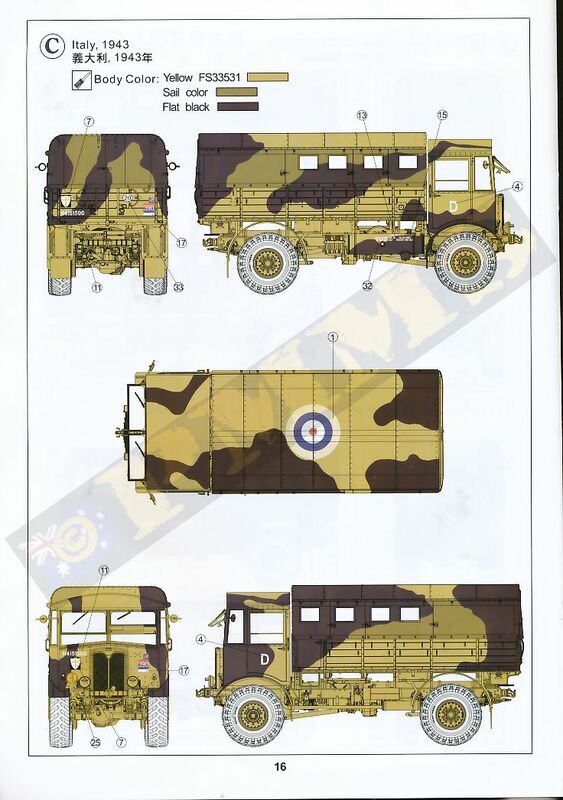 But overall this is superbly done kit which should be welcomed by Allied modellers and we can look forward to the later production truck coming as most of the parts required are already included as mentioned and also hopefully other versions such as the 6x6 AEC Model (0)854 and maybe the Deaconseeing as AFV Club already have the 6pdr kit done.